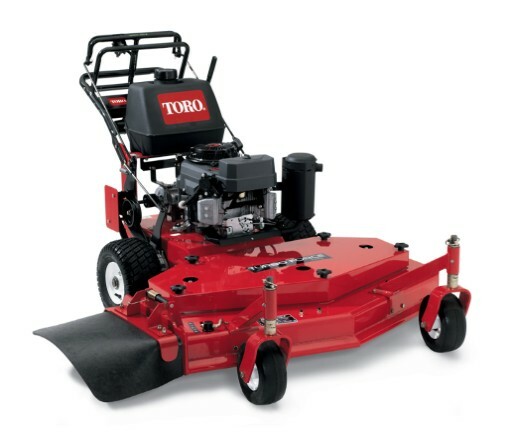 Mow tough property with ease by using the Toro® 48" Walk-Behind Commercial Lawn Mower. This walk-behind mower moves with agility due to its power and being self-propelled. Tackle golf courses, resorts, apartment communities and more. The outstanding hydraulics, 10 cu. cm. displacement pumps and wheel motors provide instant forward and reverse control without shifting. You are sure to get the work done with the variable ground speed ranging from 0 to 6.2 MPH forward, and 0 to 2.2 mph in reverse. You'll get a flat, crisp cut with the 1/4" thick precision blades resistant to flexing. High-strength, heat-treated alloy steel survives impacts and provides resistance to the rapid wear commonly associated with abrasive conditions. The rubber discharge chute allows for close cutting without getting any damage. As made popular on Toro Z Master zero turn riders, the high-performance rubber discharge chute allows for close trimming without damage and provides exceptional clipping dispersion.